Overcup oak (Quercus lyrata) leaf. Overcup oak is a medium-sized tree with an irregular crown, twisted branches, and a swollen base when growing along the edges of swamps. Leaves alternate, simple, 3–10 inches long, narrow but broadest above the middle, with 5–9 rounded lobes, middle lobes usually widest, often squarish, notch of lobes with various shapes, leaf tip rounded to pointed; leaves dark green and shiny above; light green and hairy beneath; turning yellow, brown, or reddish in autumn. Bark brownish-gray and rough, with large, irregular plates or ridges. Twigs slender, angled (not circular in cross-section); green and hairy at first, becoming gray-brown and smooth with age. Fruits September–October; acorns solitary or paired; nut light brown, globe-shaped, to 1 inch tall, more than ½ inch wide; cup deep, lacking fringes, nearly enclosing the entire nut; scales sometimes warty and ragged toward the tip, otherwise flattened. Seeds edible; acorns ripen the autumn of the first year. Acorns are almost completely covered by their knobby cups. Leaves have long, narrow lobes, with wide sinuses between them. In Missouri, grows naturally only in wet forests along the Mississippi and Meramec rivers. Overcup oaks occur in wet bottomland forests bordering swamps and in valleys with floodplain forests. Overcup oak (Quercus lyrata) acorn. Acorns of overcup oaks are almost completely covered by their knobby cups. Overcup oak leaves are distinctive, with 5–9 rounded lobes, middle lobes usually widest, often squarish, the notches of lobes with various shapes, and the leaf tip rounded to pointed. The bark of an overcup oak tree is brownish-gray and rough, with large, irregular plates or ridges. Overcup oak is a medium-sized tree with an irregular crown and twisted branches. Occurs in wet bottomland forests bordering swamps and in valleys with floodplain forests bordering the Mississippi and Meramec rivers. This tree is adapted to use seasonal floodwaters as a way to float acorns to new sites for dispersal. Slow-growing and long-lived, these attractive trees can also tolerate dryer conditions and are cultivated as shade trees for low areas. 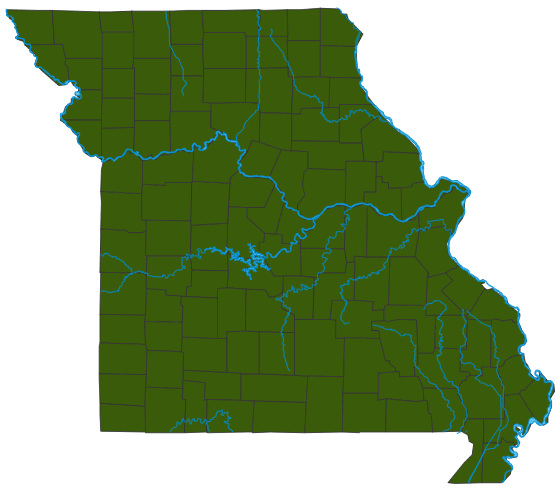 Restricted to southeastern Missouri bottomlands and a few localities in east-central Missouri, particularly along the Mississippi and Meramec rivers. Cultivated statewide. Native Americans valued the astringent properties of oak bark and used it medicinally. The wood of this species is strong, hard, tough and durable — therefore quite valuable. This species, with its beautiful fall color, makes an excellent landscaping tree for wet or low-lying areas. Many animals eat the acorns. Trees create their own small habitats upon their surfaces and with their shade. Countless insects creep around on the bark. Many herbaceous (nonwoody) plants, including wildflowers, can only survive among the leaf litter on a shaded forest floor.